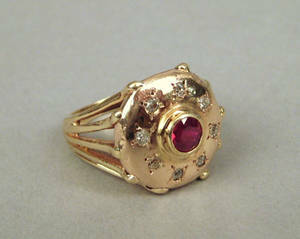 14K yellow gold ring with ruby, approx. 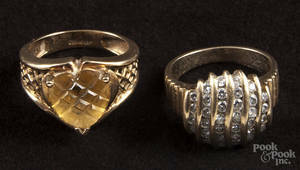 1/2 carat and 8 single cut diamonds, approx. 1/8 carat tw., 4.4 dwt. 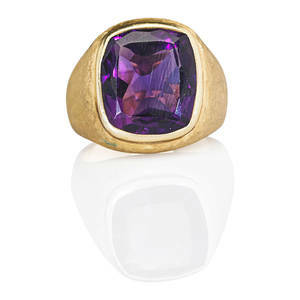 Gentleman"s amethyst 14k yellow gold ring; cushion shaped faceted amethyst, approx. 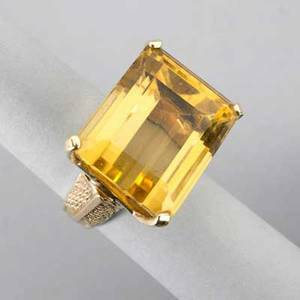 11.7 cts. by formula, in bright bezel setting on florentine ground, ca. 1965. marked "14k". size 9 1/2. 10.9 dwt. 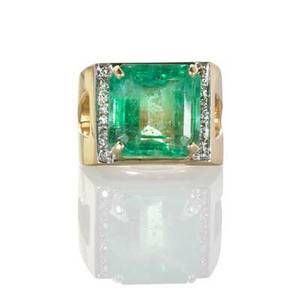 Large emerald and diamond 14k yellow gold ring; square step cut emerald, 14.4 mm., 15 cts. 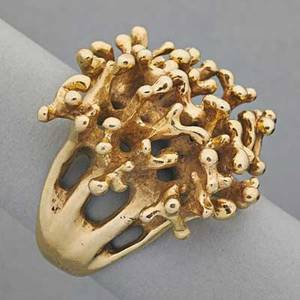 by formula, geometrically set to bead set diamond shoulders, ca. 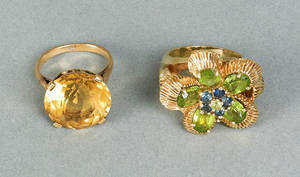 1970. marked "14k". size 7 3/4. 16.5 dwt.